Kildare Nationalist — NOWHERE LIKE NEWBRIDGE! IT was most discussed sporting event in Ireland last week and in the end, the action on the pitch lived up to the talking off it as Kildare recorded a famous 0-21 to 0-19 win over Mayo in St Conleth’s Park on Saturday. 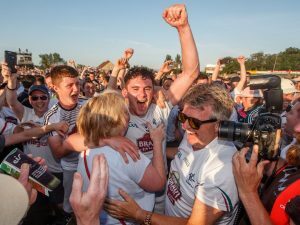 ‘Newbridge or Nowhere’ was the slogan in the week leading into the game as the Kildare county board, and manager Cian O’Neill, fought their corner against the GAA but by the final whistle it was proved that there is nowhere like Newbridge. Any health and safety concerns proved to be unfounded as 8,200 Kildare and Mayo supporters comfortably enjoyed the game, with live coverage on Sky Sports also accommodated. Fans of both sides queued to get in and within 15 minutes of the gates opening, two hours before throw-in, all seats in the stand were taken but there was never any hint of trouble and all attendance thoroughly enjoyed the game, the Kildare fans slightly more so. The players on the pitch responded to the crackling atmosphere coming from the stands and Kildare recorded perhaps their best since the 2000 Leinster final. The win means that Kildare need to beat Fermanagh in Round 4 of the Qualifiers this Saturday evening to ensure qualification for the inaugural Super 8s competition. GAA President John Horan spoke on national radio and confirmed that should Kildare reach the Super 8s that Kildare will, as is their right, have home advantage for one of the games and that Newbridge will host another Championship game. If that occasion is anything like Saturday’s game then it is a game not to be missed but nobody in the Kildare camp will be getting too far ahead of themselves and they will be solely focussed on beating Fermanagh this weekend first.